winner of the national running day giveaway! 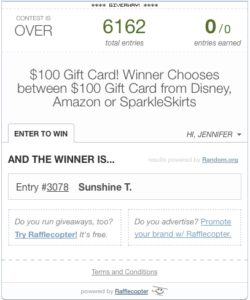 Sorry to be posting this great news so late today, but I am pleased to announce that we have a winner of the $100 gift card to Amazon.com, Sparkle Skirts or Disney. 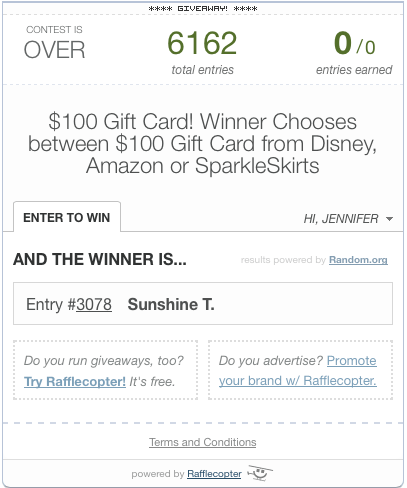 Congratulations, Sunshine T.! I hope you have fun spending your gift card! Thank you to everyone for entering! And thanks also to running bloggers April of Run The Great Wide Somewhere, Patty at My No-Guilt Life, Anne at Outrunning the Fork, and Cara at Running In Sanity for teaming up to make this happen!